Photodynamic therapy (PDT) is a unique treatment with clear benefits in non-melanoma skin cancers and precancerous lesions. It is noninvasive, selectively treats abnormal cells, and is relatively inexpensive. Despite these accolades, it is an orphan treatment often rejected for other treatment options. PDT uses porphyrin molecules that have selective penetration of abnormal epidermis. Activated by specific light frequencies, these molecules create a cytotoxic effect, selectively injuring the neoplastic lesions. Two such porphyrins have been utilized – the more common aminolevulinate (ALA, Levulan Kerastick) and possibly the more effective methyl aminolevulinate (MAL, Metvix). FDA-approved only for treatment actinic keratoses, this technology has been applied to treatment of squamous cell carcinoma in situ (SCCis) and superficial basal cell carcinomas (sBCC). Treatment of MAL-PDT is delivered after 3 hours of MAL cream under occlusion, followed by 15 minutes of red light exposure. More common in the US, ALA-PDT uses blue light frequencies. Burning and stinging occur mostly during illumination but can persist for a day. Treatment is usually repeated 1 week later and occasionally in 3 months if complete responses is not achieved. Surface debridement or curettage can improve penetration and efficacy. Summarizing various studies demonstrates efficacy of PDT for AK at 85-90% complete response. Bowen’s disease is cleared in 90% of cases but at 2 years that number is reduced to 68%. Superficial BCC (sBCC) and thin nodular BCC (nBCC) are cured in 75-95% of cases after 3-5 years in various studies. Thick BCC are cleared in 80-85% of cases at 2-4 years. It is fair to say that MAL-PDT achieves a long-term cure for BCC in 80-95% of cases, with the median falling above 85%. Although AK’s achieve a similar success, the available studies for Bowen’s disease show worse long-term cure rate than other pathologies. Cosmetic outcomes are found to be superior to all other treatments. With this data in hand, it is no wonder that British studies form the NHS hospitals and clinics recommend PDT as “the treatment of choice” for primary sBCC in a low risk site (not in central face) that are 2cm and “generally good choice” if < 2cm. They also claim PDT as “generally good choice” in recurrent sBCC in low risk sites. The next category of “fair choice” is reserved for primary nBCC < 2cm in low risk site, primary sBCC < 2cm in high risk site, and primary sBCC 2cm in high risk site. 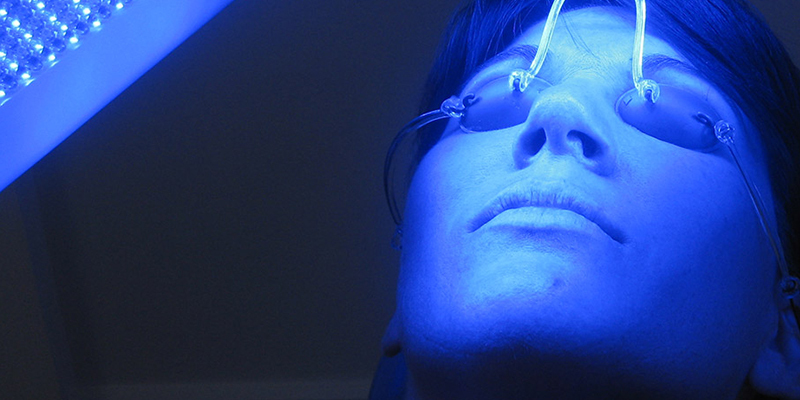 There are a few innovative applications for photodynamic therapy described. PDT has been successfully applied in Basal Cell Nevus Syndrome patients. Unique delivery methods have included intralesional ALA injection and an ALA patch for specific lesions. In addition to fluorescent and LED light sources, IPL (Intense Pulsed Light) has been utilized with success as stand alone and in addition to the traditional light sources. The unique advantages of photodynamic therapy for skin cancers is the ability to treat large areas of field cancerization, the relatively low cost, and the superb cosmetic results. Its under utilization as a modality for non-melanoma skin cancer management in the United States is likely related to economics of the treatment and patient expectations.